Blackberry Ice Heuchera has beautiful deep purple black leaves that will add depth to your garden or landscape areas. In early spring, the Blackberry Ice Coral Bells begins to pop with yellow flowers. No deadheading is necessary to keep the plant in summer shape. Use compost as mulch around your Proven Winners Blackberry Ice Heuchera. 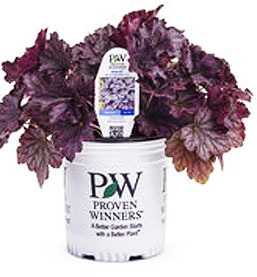 When this item is sold out - the Black Pearl Heuchera is a wonderful substitute. Blackberry Ice Heuchera grows in a one gallon pot. Plants shipping to CA or AZ will be bare rooted and prepped before shipping.